In their book ‘Co-Opetition: A Revolution Mindset that Combines Competition and Cooperation‘, Adam M. Brandenburger and Barry J. Nalebuff discuss a new notion of competition. By combining business strategy and Game Theory, these authors argue that it is better for competitors to work together rather than go up against each other in contest. Co-opetition (or coopetition) combines the advantages of both competition and cooperation into a new dynamic model called the Value Net Model, which is largely an elaboration of Porter’s Five Forces Model. In their eyes, Porter’s Five Forces focused almost entirely on competition and failed to include the collaborative potential in an industry. When companies work together, they can create a much larger and more valuable market than they ever could by working individually. Industry players should therefore focus more on ‘growing the pie’ than ‘splitting up the pie’. After all, it’s better to own 20 percent market share of a $10 billion market than to own a 75 percent share of a $2 billion market. Real long-term business success comes not solely from competing successfully within your current industry (playing the game), but also from being an active participant in shaping the industry’s future (changing the game to your own advantage). This article will explain the Value Net Model in more detail and how to use it yourself. The Value Net identifies four types of players that every company faces and could directly influence your company: Customers, Suppliers, Competitors and Complementors. Each of these types of players offer opportunities for cooperation with your company, even the Competitors. Note that any given player can take on multiple roles (e.g. a company can act as both a Supplier and a Competitor). Customers and Suppliers are already largely covered in our article on Porter’s Five Forces. These two types will therefore only be explained briefly here. The focus of this article will be on the Competitors and the added component of this framework: the Complementors. Customers are the people or parties that buy your product or service. In return, money goes from the customer to the focal company. Without customers a company has not much reason to exist. More customers means more revenue, which in turn leads to a larger market share. Customers can be end-consumers or other companies that will eventually take the products to the consumer market. In Porter’s Five Forces this category is labeled as ‘Buyers’. Suppliers are the parties that provide your company with the resources needed to produce or sell your final products. They are important external factors to take into account since suppliers have the potential to raise prices and/or reduce the quality of the purchased inputs. 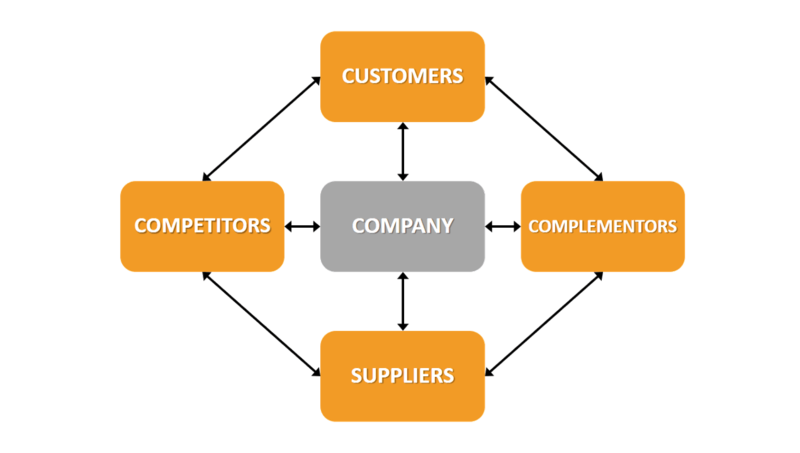 It is therefore key to keep good ties with suppliers or spread risk by having multiple suppliers to choose from. Competitors are the parties that fight over the same pieces of market share as your company by targeting similar customers with similar products or services. However, companies often view competition way too narrow thereby failing to foresee upcoming threats. Most people would agree that two airline companies with the same destinations are considered competitors. Railroad companies with international high-speed trains, on the other hand, are often not included in the competitor analysis even though they fulfill the same customer need: traveling. Although competitors are often seen as parties to fight over market share with, it is actually perfectly possible to collaborate with as well. On the supplier side, competitors could combine forces when purchasing similar raw materials. By bulk purchasing alltogether, you are able to negotiate discounts and lower the cost per unit. Even on the customer side in for example the automotive industry we see cooperation: in 1999 Renault and Nissan started an alliance in order to benefit from each others’ complementary capabilities. Both companies had strong positions in different geographical markets which would help with international expansion. Moreover, Renault could benefit from Nissan’s excellent manufacturing capabilities, while Nissan could rely on Renault’s strong financial resources. By combining forces they were better able to offer high-quality vehicles to their customers for competitive prices. The Competitor category of the Value Net combines the ‘Existing Rivalry, New Entrants and Substitute Products’ from Porter’s Five Forces into one force. This is a category of the Value Net that many business owners and managers fail to consider. Rather than competitors, this category includes organizations that offer (complementary) products or services that could work well together with your own products to make the end result more attractive to consumers. Think about software and hardware companies working together to enhance the user experience as much as possible. Another example of complementary companies comes from the airline and tourism industry. When consumers head to a tourist destination, they often get there on an airplane. Similarly, whenever consumers travel on an airplane, they are likely visting a destination which is a part of the tourism industry, such as a hotel, camping or a rental car agency. 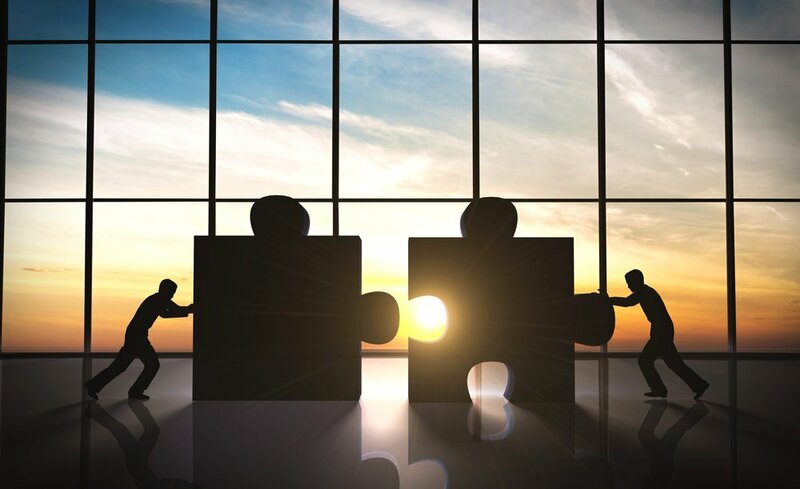 These two industries are proved complementary and it therefore makes sense for companies in these industries to partner up and offer a more complete value proposition to their customers. TUI is for example doing this in Europe. Companies would be wise to also keep these kind of players into account when analysing the industry. Since the Value Net’s Complementors component is not included in Porter’s Five Forces but yet highly relevant, it is often indicated as ‘The Sixth Force‘. Players: Ask yourself who the players are in the game and divide them into Customers, Suppliers, Competitors and Complementors. What are the opportunities for cooperation and competition with each of the various players? Are there any parties you could potentially form a strategic alliance with? Who else could or should join the industry? And who stands to gain or lose if they do join? Added value: Added value measures what each player, in each role, brings to the table. In addition, think about your own company’s sources of value (competitive advantage or USP). The VRIO Framework or a Value Chain Analysis could help with this. Are there any ways in which you could combine forces in order to add value for Suppliers or to Customers? Rules: Each industry and market has rules and regulations. Some are written and enforced by law, some unwritten but generally accepted practices. Which rules are helping your company? Which are hurting your company? Who has the power to create, enforce and overturn rules? Perhaps there are certain rules of the game that can be changed in your favor by collaborating with the right parties. Tactics: What actions can one player take to shape the strategies, actions and perceptions of other players in the market? How can you deliberately send signals and messages that influence the perception of other players, which in turn may influence their actions? Spending more on advertsing for example might signal that you have more confidence in your product or service and that your business is going well. There is an element here of figuring out to what extent it is in your company’s best interest to have the market rules be very transparent or rather opaque. Scope: Industries are often not isolated, but linked to other industries instead. Plenty of recent examples have shown that the software, hardware, media, e-commerce, advertising and telecommunications industries are either closely interlinked, or that players in some industries have taken deliberate strategic moves to pro-actively link them. They key is to ask what industries could potentially be linked, how your company could create added value from linking your products and services to that industry, and how that may affect the perceptions and actions of other players. Coopetition offers a completely new way of looking at the industry. Instead of fierce competition between other players in the industry (e.g. suppliers and competitors), it is perfectly possible to collaborate and come up with solutions that would benefit all players in the game. It allows a shift from a zero-sum game to a win-win situation. The Value Net and the PARTS approach may help to identify possible industry players to cooperate with. Moreover, the Value Net is a nice extension to Porter’s Five Forces since it includes the Complementors component. Especially since it is getting more and more important to remain flexible and innovative as a company, strategic partnerships with other companies (including competitors) sound like a great way to sustain competitive advantage. Brandenburger, A.M. & Nalebuff, B.J. (1996). Co-Opetition: A Revolution Mindset that Combines Competition and Cooperation. Crown Publishing Group.